Bishop Johann Funk with his third wife Louise and foster daughter Justina Klassen, taken ca. 1890. Johann Funk: church elder: born 26 December 1836 in the village of Nieder-Chortitza, Chortitza Colony, South Russia, the son of Peter Funk (1799-1881) and Margaretha (Braeul) Funk (1806-1889) (see Additional Information for further information regarding Johann’s family). Johann Funk died 17 March 1917 in Altona, Manitoba, Canada. Funk grew up and was educated in Nieder-Chortitza. He was baptized on 27 May 1857 in the Bergthal Colony church and later that year he married Margaretha Braun. After her death in 1861, he married Susanna Rempel. In July 1875 Funk brought his family to Canada where they settled on the Manitoba East Reserve. He was ordained to the ministry by Gerhard Wiebe in 1877 and later to the position of Elder in 1882. Funk is most well known for the key role he played in the Gretna School controversy. Questions were being raised in the church about the need for a Mennonite teacher training school. Funk supported schools to train teachers and sided with H. H. Ewert who became principal of the teacher training school at Gretna. This alienated him from the more conservative members and leaders in the church. The controversy came to a head in 1892 when Funk made clear his position on education and church discipline. Within a year the Bergthal church was divided. The majority followed Elder David Stoesz of the East Reserve but 60 families remained with Funk. Conflict continued to follow Funk during the remaining years of his ministry. These included conflict with the General Conference Mission Board over baptism and H. H. Ewert regarding the location for the school. In January of 1911 he was encouraged to resign from church leadership and was replaced by Elder Jacob Hoeppner. Brown, Sharon H. H. “Johann Funk fonds.” Mennonite Heritage Centre. 2003. http://www.mennonitechurch.ca/programs/archives/holdings/papers/Funk,%20Johann%20fonds.htm (accessed 12 May 2008). GRANDMA (The Genealogical Registry and Database of Mennonite Ancestry) Database, 5.05 ed. Fresno, CA: California Mennonite Historical Society, 2008: #173102. Klippenstein, Lawrence. "Ältester Johann Funk(1836-1917)" in Adolf Ens, Jacob E. Peters and Otto Hamm, eds. Church, Family and Village: Essays on Mennonite Life on the West Reserve. Winnipeg, Manitoba: Manitoba Mennonite Historical Society, 2001: 213-229. Klippenstein, Lawrence. "Johann Funk, Ältester of the Bergthaler Mennoniten Gemeinde of Manitoba (1882-1911)." Heritage Posting 29 (June 2000): 7. Klippenstein, Lawrence. "Johann Funk." Dictionary of Canadian Biography Online. 2000. http://www.biographi.ca/EN/ShowBio.asp?BioId=41502 (accessed 12 May 2008). Johann was the fifth of nine children born to Peter Funk (15 December 1799 – 1881) and Margaretha (Braeul) Funk (4 December 1806 – 15 December 1889). On 5 November 1857 Johann married Margaretha Braun (15 November 1839, South Russia – 17 April 1861, Bergthal Colony, South Russia), daughter of Jacob J. Braun (9 August 1791 – 15 December 1868) and Susanna (Leike) Braun (20 September 1795 – 18 September 1864). Margaretha died two years after their only daughter Susanna was born. Johann then married Susanna Rempel (26 January 1842, Schoenfeld, South Russia – 2 December 1879, Bergthal, East Reserve, MB) on 28 October 1861, daughter of Abraham W. Rempel (25 March 1813 – 20 May 1845) and Justina (Braun) Rempel (18 September 1821 – 9 October 1853). Johann and Susanna had 14 children of which only five survived to adulthood: Margaretha, Katharina, Justina, Helena, and Peter. After the death of his second wife, Johann married Elisabeth “Louise” Dueck (10 August 1855, Bergthal Colony, South Russia – 27 August 1926), daughter of Johann Dueck (21 February 1821 – 5 February 1908) and Elisabeth (Dyck) Dueck (24 July 1820 – 27 October 1883). 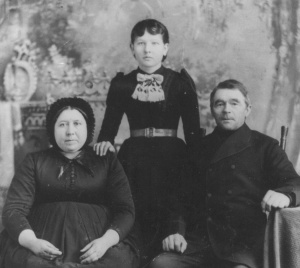 Johann and Louise had one foster daughter, Justina Klassen. Thiessen, Richard D. "Funk, Johann (1836-1917)." Global Anabaptist Mennonite Encyclopedia Online. May 2008. Web. 25 Apr 2019. http://gameo.org/index.php?title=Funk,_Johann_(1836-1917)&oldid=103986. Thiessen, Richard D. (May 2008). Funk, Johann (1836-1917). Global Anabaptist Mennonite Encyclopedia Online. Retrieved 25 April 2019, from http://gameo.org/index.php?title=Funk,_Johann_(1836-1917)&oldid=103986. This page was last modified on 24 November 2013, at 21:58.